This 3 Pack features three of our beautiful brightly colored Plush Puppy juggle balls and a logo pouch at a great savings from our regular price. It's a great way to give a quality handmade product to a juggler near you...:-) Happy juggling from Flying Clipper! 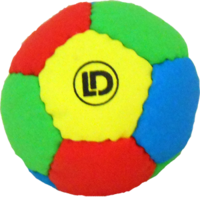 In the past I learned most tricks (3ball cascade,reverse cascade, windmill, shower, mills mess) with hard balls like baseballs/lacrosse balls, and occasionally tennis balls. 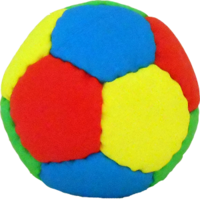 These "plush" juggling balls have been a lot easier to use as they don't break things when they go flying across the room, or fall on your toes... They are also a bit bigger than I thought (a little larger than a baseball) but are easily caught because they are "squishable". 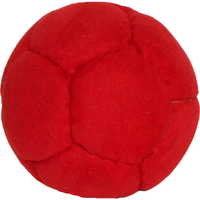 However, they make a lot of noise when juggling as if you are throwing a bag of rice up and down. 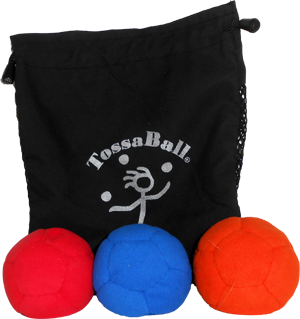 Besides that, these are a great set a balls that I will recommend to many people in the future.